Fierce competitive pressure is forcing Boeing Commercial Airplanes into a new cost-cutting push that will include eliminating jobs, BCA Chief Executive Ray Conner announced at a senior leadership meeting Wednesday morning and in a webcast to all employees. According to employees who watched the webcast, Conner also said Boeing may decide as early as this year whether to go forward with a new midsize airplane to counter Airbus’ success in sales of the A321neo, a project that would inevitably cost several billion dollars and add to financial pressure on the company. No details were given on the timing or scale of the job cuts, but the tone of the announcement suggests a significant impact across BCA. “The overall employment impact will depend on how effectively we bring down costs as a whole,” Alder added. The cuts are expected to hit Everett — where production cuts on the 747 and 777 were announced last month — more than Renton, where the 737 is still ramping up. 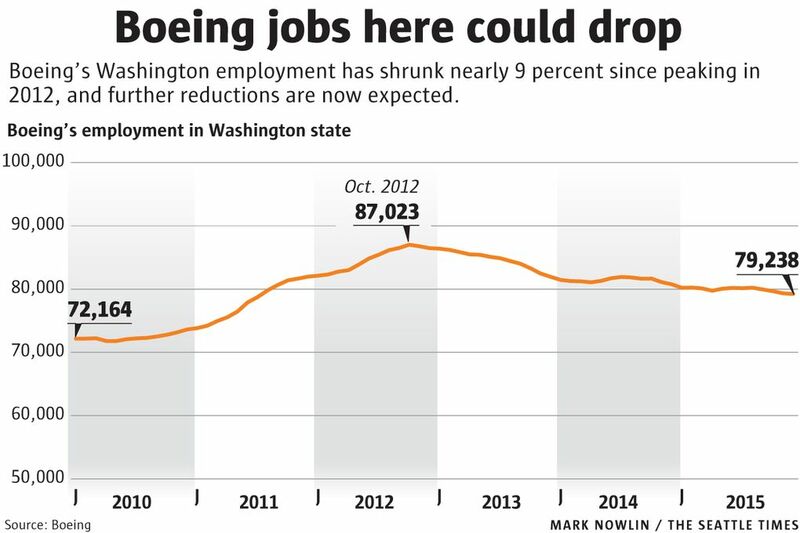 At the start of 2016, Boeing employment in Washington stood at 79,238, out of a companywide total of 161,368. That’s down almost 7,800 jobs from the most recent Washington employment peak, in fall 2012, of 87,023. The employees spoke on condition of anonymity because Boeing does not allow workers to talk to the media without authorization. According to the two employees, Conner said Airbus is “stealing massive orders from the 737” with the new A321neo, and in response Boeing needs to decide “as early as this year” on whether to launch a new airplane to fill the gap between the 737 and the 787 Dreamliner. Another employee said that while Conner made clear he wants a near-term decision on Boeing’s response to the A321neo, a formal launch of a new jet would follow later, probably not this year. Coincidentally, on Wednesday afternoon at the Pacific Northwest Aerospace Alliance’s annual conference in Lynnwood, Airbus Americas marketing director Simon Pickup made a point of presenting a slide that highlighted the “hole” in Boeing’s product line, where Boeing has no plane with the capacity and range to compete against the A321neo. Boeing itself tacitly acknowledged that gap at the Paris Air Show last year, when sales chief John Wojick said the company is studying a “middle-of-the-market” airplane — a jet seating 220 to 280 passengers with a range of 4,500 to 5,000 miles. However, that new jet program was previously not expected to be launched until 2018 or so. Conner’s remarks about making a decision as early as this year served to underline for employees both the competitive pressure from Airbus and the possible near-term spending that would be needed for a new airplane. His open discussion of Airbus undercutting Boeing pricing surprised Wall Street analysts. Last week, Boeing approached the International Association of Machinists (IAM) union to discuss a voluntary-layoff program. The union was not given specific information about impending layoffs at that time, and on Wednesday union spokesman Bryan Corliss said the company had still provided no details. “They haven’t told us anything,” said Corliss. One Everett mechanic said factory workers there expect job cuts on both the 777 and 747 assembly lines as well as the flight line. Wednesday’s announcement is a clear sign of significant financial pressure on Boeing that’s likely to increase between now and the end of the decade. Boeing’s 737 narrowbody jet and its 777 widebody jet have been the two cash cows for the commercial-airplane unit for years. However, Airbus’ A320 last year won a 60 percent share in the narrowbody market against the 737, forcing Boeing to reduce pricing and profit margins on that program. And 777 production is to dip next year from 100 jets to just over 80 aircraft. The 787 Dreamliner, though now delivering at a rate of 10 per month and soon to go up to 12 per month, is far from making up the difference in incoming cash. The 787 is close to the point where it is no longer losing money on each jet delivered, but it’s not quite there and certainly won’t be making significant profits for a long time. Speaking at the aerospace-suppliers conference in Lynnwood, Teal Group analyst Richard Aboulafia said that to cover the recurring cost of producing all its 787s and eke out an overall profit, Boeing will have to build future 787-9s at an average cost of about $91 million each — compared with an estimated cost of $140 million each in the fourth quarter of 2015. “That’s a real problem,” he said. The 787 engineer said older employees were not surprised by the news of job cuts, which he attributed at least partly to the money pit that is the Dreamliner program. 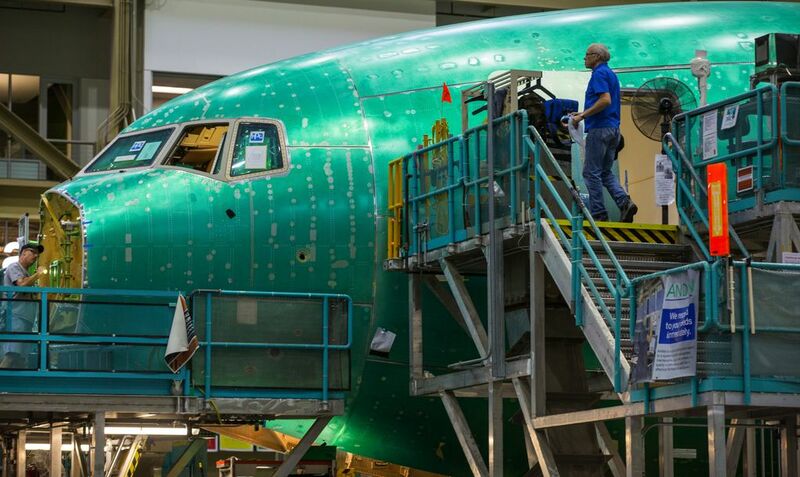 More generally, Aboulafia expressed concern over the sustainability of the long-running airplane-industry boom and skepticism that Boeing will reach the high production rates it’s already announced. Between now and 2019, Airbus and Boeing combined project a 13 percent growth in narrowbody-jet production and a 9.4 percent growth in widebody-jet production. “Man, that’s ambitious,” Aboulafia said, pointing out this assumes the booming industry growth that hasn’t flagged since 2004 will continue through the end of the decade. In the past, the airplane industry has typically gone through boom and bust phases in roughly six- to eight-year cycles. Plenty of macroeconomic factors could bring the current boom to a halt, Aboulafia said. For more than a decade, airlines have been ordering new fuel-efficient jets because of high oil prices, with low interest rates offering easy capital to do so. Now the price of oil has sunk from more than $100 a barrel to below $30 a barrel, while interest rates have begun to rise. And in the emerging markets that have driven airplane orders to record highs, the rise of the dollar makes jets more expensive. Aboulafia pointed to the large outflow of investment dollars from emerging markets last year. He said airlines in those countries that have placed huge orders based on debt and external capital may face a reckoning that could bring company failures, and jet-order cancellations for Boeing and Airbus. Even China, the biggest growth market in the airplane business, is fragile, he said. Jet deliveries to China have continued to climb steeply even as its gross domestic product figures moderate. Yet much of Boeing’s financial strength in the next few years depends on ramping up production. Management said last month it plans to build 57 single-aisle 737s starting in 2019. “I don’t see that as sustainable,” said Aboulafia. Besides the job cuts announced Wednesday, other cost-cutting measures, both big and small, are being introduced across Boeing. The company is going to stop providing employees with bottled water, managers have told several teams. Conner in his webcast also said Boeing will cut way back on meetings, so as to prioritize making airplanes instead of meetings about making airplanes. Information in this article, originally published Feb. 10, 2016, was corrected Feb 11, 2016. A previous version of this story incorrectly stated that 777 production will slow this year to about 70 jets a year. The planned slowdown is in 2017 and the rate will come down to just over 80 jets total.